How do I get the total to match my multiple selections? 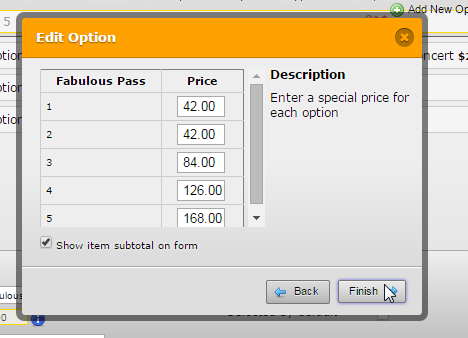 I've got the payment form set up where they can choose which pass they want, and also whether they want multiples of a pass - but the subtotal doesn't change according to those conditions. Also, I'd like to add an option for them to leave their email address to receive a confirmation email. Upon checking your form, I see that you have the same prices for the first two options, is that correct? I also recommend that you don't add a "0" quantity option. Here's the same price for the first two options. See that option 1 "1 in qty" and option 2 "2 in qty" has the same price of $42.00. I would recommend that you check again your setup if this are the correct prices. If the problem still persists, please do let us know.